What a day in History ! Rogue at the Races 2 - Revenge of the Rain God! Having been informed of the accompanying image by a friend, Rogue felt he should share this with deerhounds of the world. 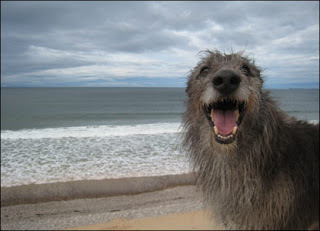 Culled from the bbc news, images of Scotland web page, it may not have been the easiest to find for deerhound fans. But that’s why this blog is here. Steven Campbell, from Aberdeen, reckons his girlfriend Morag's posing dog Boab is usually camera-shy. A deerhound camera-shy? What do you think? Click on the link and browse the archive to enjoy more images from Scotland. We apologise for the the lack of posting this week, but we are still celebrating this fabulous event here at Rogue castle! We wondered if you had heard of the Ayatollah Mugsy? He blogs at ayatollahmugsy.blogspot.com.